For Jalita's DietBet I am at 91% and have only 0.6 pounds to lose in 14 days to win my bet! For Blogilates DietBet I am at 55% with 3.1 pounds to lose in 16 days! So far I am really rocking these two bets! I will keep you posted on how I continue to do as time get closer to the finish date! I am starting a DietBet challenge of my own on July 1st which will run until July 28th, so if you want to join, here is the link Sandy's DietBet Challenge. The dates work out perfect for me because July 29th is when I go on vacation! Woo hoo! I am super excited about that one! Now have I got a great recipe for you... well you know it is that time of year when we all bring out our grills and enjoy the beautiful sunshine outdoors! Considering Vegas gets well over 100 degrees quite often (hey what can you expect living in the desert and all), we typically grill in the morning or in the evening because the afternoon heat can get unbearable. Well at least for us, considering we came from Colorado. Definitely not like the cool mountain air in Colorado , although it does get pretty hot there too! My husband and I love to grill... well actually, he likes to grill and I like to eat the grilled food :) My famous words, "Call me when it is done honey!" Yeah, we make a great team! Anyways, I got this recipe from Karen over at Living Low Carb One Day at a Time and it sounds amazing! It contains two of my favorite things in the recipe! Shrimp and Frank's hot sauce! You just can't go wrong there! The perfect dish for summer! The best thing about this recipe is that it is great dish to bring to a pot luck or serve your family at home while staying on plan. A crowd pleaser for sure! I would limit this dish on occasion because Frank's hot sauce does have a lot of sodium so weigh in on Friday and eat this on Saturday :) I love this recipe! Combine butter and hot sauce in a small bowl and microwave for about 45 seconds or until butter is melted. Stir until combined. 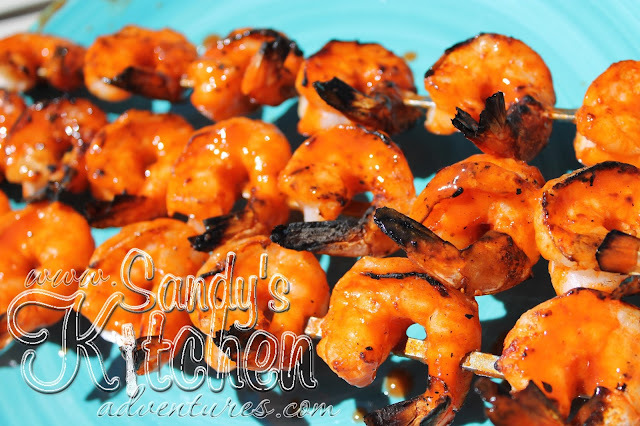 Place shrimp on skewers. I basted very lightly with the sauce, saving the majority of the sauce for when they were done cooking. Grill until shrimp are cooked, about 2 minutes on each side. Baste with remaining buffalo sauce. Don't forget to weigh your shrimp after they are cooked. You should have 7 ounces of cooked shrimp, but if you are serving the ranch broccoli slaw with this meal, you will only need 3/4 Lean which is 5.25 ounces cooked. 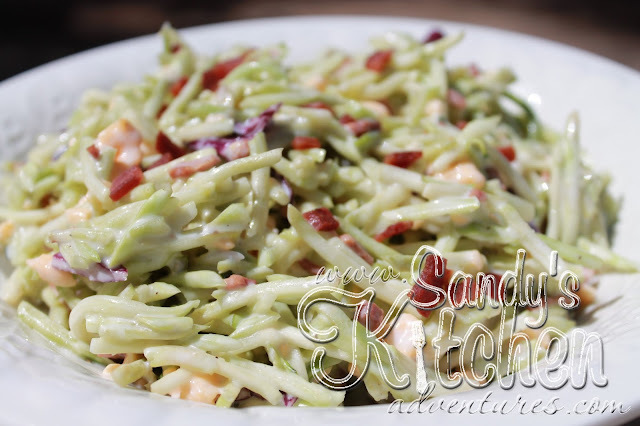 Here is the recipe for the ranch broccoli slaw. As you can tell, both recipes are really, really easy. This one doesn't even require any cooking at all so no burning down the house! Just mix the ingredients together and you got a tasty side dish. The coolness of the ranch dressing pairs well with the bit of heat from the shrimp and it has a nice crunch! A match made in heaven! I bought the broccoli slaw at Wal-Mart. It was called Marketside Broccoli Slaw and yes unfortunately it did have bits of carrots mixed in, but I picked them all out. Well, most of them anyways. It wasn't easy, but I did it :) The added cheddar cheese and bacon bits complete the dish so don't forget to add them! Have a wonderful weekend you guys! Stay on plan and you won't regret it when Monday comes right around the corner! Combine all ingredients in a medium sized bowl. Stir until combined. Serve chilled.